Fire during his stay at the New Bolton Center. A research study into fertility in older stallions proved to be the path to a retirement home for an elderly appaloosa stallion named Fire that dozens of rescues had refused to take. Louisa Shepard reports. As the rain pelted down outside a rural Pennsylvania barn 30 years ago, the song playing on the radio was the hit, Wildfire. The family, gathered to watch their appaloosa mare give birth, named the foal after the song. They later invited a friend to come by to see the black colt with the white spotted hindquarters. “As soon as I saw him, I totally fell in love with him,” said William Faust Jr, who bought the colt six months later. Called Fire for short, he joined Faust’s horse, Injun, another stallion, in a barn in Pottsville. Faust dreamed of starting a business to breed and show his two stallions, but the auto-body shop he owned consumed all of his time and energy. Still, for more than 30 years, he visited the horses twice a day, every day, to give them attention, feed, and water. Recently, Faust lost his auto-body business to the recession. Injun died, and Fire, now alone, went into a depression. Finances forced Faust to sell the barn, which was in serious disrepair. He searched for a place to keep Fire, or a rescue to take him. On a weekend in April, Rebecca Schafer, a Pennsylvania Humane Law Enforcement Officer, went out to investigate a horse cruelty call. She saw Faust feeding Fire when she arrived. Realizing this was not a cruelty case, she listened to Faust’s story and decided to help. An employee at one of the rescues told Schafer about a research study regarding fertility in older stallions. Working with a grant from the Grayson-Jockey Club Research Foundation, Dr Regina Turner, of the New Bolton Center, part of the University of Pennsylvania’s School of Veterinary Medicine, is studying the decline in fertility in horses due to advancing age. Dr Turner was very happy to learn about Fire. “It’s really hard to find and obtain testicles from old horses,” Dr. Turner said, explaining that male horses that are still stallions by the time they are 30 are often valuable genetically and are not candidates for castration. Through her research at the Hofmann Center for Animal Reproduction at the New Bolton Center, Dr Turner has confirmed that fertility problems in older horses are due to defects within the testicle itself, rather than problems with the larger endocrine environment. Later experiments showed that the presence of young testicular cells can improve the condition of the older testicles. “In the presence of young cells, the old cells did better and survived longer,” Dr. Turner said. She now is working to isolate cells from young testicles to discover which cells are responsible for this effect. In exchange for the donation of Fire’s testicles for research, Dr Turner offered to have Fire’s surgery and care performed at the New Bolton Center, with the surgery funded entirely by the research grant. Fire’s testicles would be the oldest in her study. As a gelding, Fire would have a better chance of finding a home. So Faust agreed, and Fire received the best possible care and attention from the center’s renowned team. Dr David Levine, staff veterinarian and board-certified surgeon, performed the castration. Dr Bernd Driessen, section chief of emergency, critical care, and anesthesia, performed the anesthesia. Dr Mary Utter, assistant professor of ophthalmology, examined Fire’s eyes. He had lost sight in one eye, which had collapsed, but was not painful. His other eye had corneal ulcers that were treated with antibiotic ointment. Dr Caitlin Rothacker, of the center’s Field Service, filed Fire’s teeth and recommended a new diet that would help Fire put on weight. He also was vaccinated and dewormed. Patrick Reilly, the chief of farrier services, trimmed Fire’s hooves. Fire at his new retirement home, where he has settled in well. Fire had to have a place to go after the surgery. 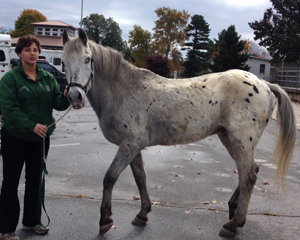 Schafer contacted Lisa Shotzberger, the animal welfare manager at Ryerss Farm for Aged Equines in Pottstown. A nonprofit founded in 1888, Ryerss Farm accepts older horses, along with a “dowry” fee of up to $US7500 to cover the anticipated cost of care. On occasion, rescue horses are considered without the fee, and sponsors are sought to cover basic costs. After hearing Fire’s story, Shotzberger pleaded his case to Ryerss Board of Managers president Samuel Griffin, who accepted Fire, once gelded, and waived the fee. Fire now has two sponsors, each paying $30 a month to help pay for his care. Faust agreed to pay for his medication. Article courtesy Penn Vet’s New Bolton Center. Learn more about the Hofmann Center for Animal Reproduction here.